Long story short – Animals United (trailer) is a crappily-written CGI movie. Avoid it. 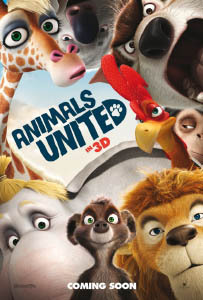 Animals United is the British dub of a 2010 German 3D production, Konferenz der Tiere (Conference of the Animals), based on a 1949 children's book by Erich Kästner. More accurately, the movie took bits and pieces from the book and ignored the rest. It had been adapted into animation once before, in 1969. You know you're in for a bad film when the second conversation involves independently re-inventing the game of golf and has the following dialog: "Yes, but what was that?" - "Only hard-as-a-rock, sun-dried hyena poo-poo." Sadly, this becomes relevant later on. Basic story: African savanna. The annual flood hasn't shown up, everyone needs water, so Billy the meerkat risks venturing into the Valley of Death and discovers a giant man-made dam that's trapped the water for an artificial lake and luxury hotel. He's joined by his friend Socrates the lion and a gang of other animals not native to Africa. It's horribly written and badly paced. There aren't any really good jokes in it, save for some predictable gags when the lion explores the hotel gym. It's all downhill from there, not that there's much of a slope to begin with; I doubt even little kids would enjoy this crap. The characters are pretty one-dimensional and the schtick gets tired fast. The giraffe obsessing over her appearance. The swishy monkey hairstylist. The capitalist human hotel owner and his voice-of-reason kid. The revolutionary French rooster who gets far too much screen-time. The Tasmanian devil who explosively farts a huge noxious cloud of green gas out of multiple orifices – which, I gotta tell ya, fails to increase in hilarity each time he does it. This is the kind of movie where you feel compelled to shout at its stupidity. If the savanna animals have never heard of humans before, how come they know how to sing "Splish Splash" and "King of the Road"? What kind of lion parents would name their cubs "Socrates" and "Mambo"? What ocean course does a floating bathtub take in order to pick up animals from Australia, the Arctic and the Galápagos, to eventually land in Africa? How does Hunter teleport from the top of the dam to the other side of the valley, driving a jeep? Why would a hotel own a biplane equipped with a missile? Where'd that motorboat come from?? If your token child character is supposed to be wiser than the adults, why would she think it's safe to pet or release a caged lion?! If you're going to build a giant hydroelectric dam to generate electricity, why aren't you running water though it?!? MALE KANGAROOS DO NOT HAVE A POUCH!! (Deep breaths) On top of this, it's hitting you over the head with environmentalist themes with less subtlety than a Miyazaki film. Especially the tortoises, who have to point out just how bad humans are to the planet, which takes four-and-a-half grinding minutes. Now comes the difficult part of this review: Can anything positive be said about the film? Well, except for the kangaroo's buzz-cut, pouch and floppy ears, I thought that visually-speaking, the character designs were good. Some models were obviously overused, like the cape buffaloes and rhinoceros. But if you're a lion or meerkat fan who needs online user icons, you might be able to snag some from this film. Particularly if you need a meerkat with a good cartoony expression of panic. Despite trying to tempt audiences with known British entertainers, the voice-acting is pretty dull. Because the film was originally in German, the speech doesn't always sync up properly. 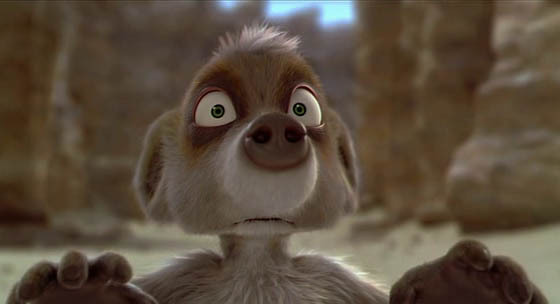 The main character, Billy the meerkat, is voiced by James Corden. Unfortunately, because Billy is a scatterbrain, Corden can't deliver lines with gravitas, and ends up sounding like a high-pitched cartoony goof. 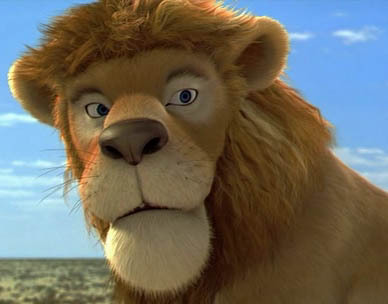 Socrates the lion is far more interesting as a character, and is voiced by Stephen Fry, so he sounds great! Unfortunately he's the most lazy lion imaginable, so his plot potential is handicapped right from the start. For the second half of the film he's largely absent due to being locked up. Still, he's the smartest character in the whole thing (relatively speaking); we get to see flashbacks from his younger days, and he has the odd quirk of being a vegetarian. I wish the film had done more with him! Overall, this movie isn't worth bothering with. In furry circles, it might be useful at a furmeet, if only as something to play in the background with the sound turned off. If the meet's energy is low, or if some folks are shy, or if you don't want the TV used for something else, Animals United can serve as a momentary distraction without being engaging enough to prevent people socializing. There are lots of films like this; Alpha and Omega, Roadside Romeo, The Missing Lynx, Animalympics... not good enough to really entertain, but not bad enough that they can't lend a little silent background atmosphere to a gathering. That's about as good as it gets sometimes. I liked "Animalympics". Since it was a spoof of TV sportscasting, it made sense for it to lack any character depth or plot development. Hi Fred! I'll echo (and extend) a reply I previously posted on FNN - I should clarify my position on Animalympics a little. It's got cute little scenes and characters in it, like the spotlight on Dean Wilson the otter, or the bit with the Contessa in the fencing match. We all have our favorites. While it might not have character depth - it does an *amazing* job of showing how you can use anthropomorphics to express character in general. (The Blacksad comic being a similar example.) That scene with the longhorn doing the shot-put - it's only seconds long, with no speech, but it simply exudes attitude. Things like that really show the creativity of the animators! The spoof aspects haven't held up as strongly over time, at least anything linked to popular culture, if you're not from the generation that grew up then. It helps if you're familiar with Howard Cossell and Barbara Walters, but if you aren't, some of the jokes go over your head. At one showing in the early 90s, one person I was watching it with recognized that the dolphin doing commentary on the swimming competition was a parody of someone, but I'd never heard of them, so the voice didn't change the entertainment for me. And as a whole, it's very disjointed from being edited together from two tv specials, and although the puns are creative, there aren't any huge laughs - only small chuckles. Whenever I've played this for a group, there havn't been many big group laughs. When it's over people say, "Well, that was cute," but the energy level of the audience isn't appreciably higher, and occasionally is slightly lower. Maybe I'm playing it for lame people. :P In any case, that's why I say it works as good background atmosphere at a meet. If memory serves, the person being parodied by the dolphin announcer was Mark Spitz, who won several gold medals in swimming at the 1972 Summer Olympics. I always thought Animalympics was a pretty good movie, but then maybe it's because I'm old enough to recognize some of the cultural references that would be lost on younger viewers (e.g. the aforementioned parody of Howard Cosell). It also seemed to poke fun at a particular style of sportscasting that was used by ABC network in their Olympic coverage during that era (Olympics were nearly always covered by ABC during that time period). I particularly liked the storyline with Kit Mambo and René Fromage. Last time I watched it I remember noticing things that I would have sworn they must have stolen from furry fandom, such as the "paw" Olympic logo, if it wasn't for the fact that it was produced several years before the earliest vestiges of furry fandom existed. Yes, the swimming champion was Mark Spitz, and he was deliberately parodied as an exaggerated California surfing dude because that's what the animators wanted to parody. The real Spitz, needless to say, was not that much a living caricature. Merlino's edit of the two Animalympics TV specials, or the half-hour Winter Olympics special that was broadcast and the WB video movie made from the cancelled one-hour Summer Olympics special, is MUCH better than the official WB home-video release! Dean Wilson (the otter swimmer/diver athlete) was indeed a textbook example of an exaggerated California surfing dude, but that's not the same character. The Mark Spitz parody (named, appropriately enough, Mark Spritz) was a different character, a dolphin who only appeared as an announcer and was represented as a past competitor in the events he was covering. Are you confusing the two? Right, right, right! I don't know what I was thinking!